Tetsuro Matsuzawa begins his working day, conventionally enough, in front of a computer. He taps in a few commands, takes a seat and waits. Within minutes, the calm of his basement laboratory is pierced by the sound of excitable primates. On cue, two chimpanzees appear through an opening in the ceiling, flash a look of recognition at Matsuzawa, and then aim an inquisitive stare at his unfamiliar companion from the Observer. Matsuzawa feeds them a spoonful of honey each and wipes their hands and fingers – a near-daily ritual meant to reward them for arriving on time, and to encourage them to show up again the following morning. After all, Ai, a 36-year-old chimpanzee, and her 13-year-old son, Ayumu, are free to stay in their nearby home, a re-creation of a west African rainforest they share with 12 other chimps. 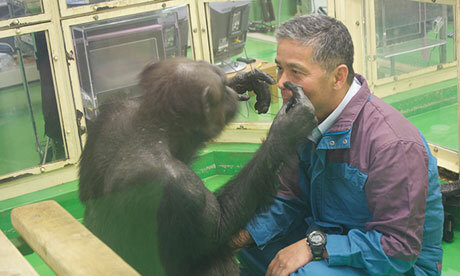 That they are such willing participants in Matsuzawa’s experiment is a tribute to the bond that has built up between the professor and the chimps during many years of research. Over the course of more than three decades, Matsuzawa, a professor at Kyoto University’s Primate Research Institute in Inuyama, a historic town in central Japan, has gained unprecedented insights into the workings of the primate mind, and by extension, our own. In a landmark test of short-term memory conducted in public in 2007, Ayumu demonstrated astonishing powers of recall, easily beating his human competitors, who had been in training for months. The strength of Ayumu’s cognitive functions surprised even Matsuzawa, who has studied the mental dexterity of chimps for 36 years. He makes long annual visits to Bossou in south-eastern Guinea, where he witnesses chimps display in the wild the same powers of recognition and recall that Ayumu and other young chimps demonstrate on his computer screens. The results stunned observers. In the tests, Ai and Ayumu, and two other pairs of a mother and offspring, were shown the numerals 1 to 9 spread randomly across a computer screen. Their task was to touch the numbers in ascending order. To complicate matters, the game was altered so that as soon as the chimps touched the digit 1, the remaining eight were immediately masked by white squares. To complete the exercise, they had to remember the location of each concealed number and, again, touch them in the correct order. In an even harder version, five numbers appeared on the screen before turning into white squares. The animals and their human counterparts displayed the same degree of accuracy – about 80% – when the numbers remained visible for seven tenths of a second. But when the time was reduced to four tenths of a second, and then just two tenths, Ayumu maintained the same level of accuracy, while his mother and the human volunteers floundered. Given that humans share 98.8% of their DNA with chimpanzees, why do the latter have such vastly superior working memories? For the chimps, the ability to memorise the location of objects is critical to their survival in the wild, where they compete for food with other, often aggressive, ape communities. To thrive, an individual chimp must be able to look up at, say, a sprawling fig tree and quickly note the location of the ripe fruit. Six years after Ayumu first demonstrated his skills in public, the institute’s researchers are trying to find how far he can go before he falters badly. In the most recent tests, the number of digits has been increased from 1-9 to 1-19. The juxtaposition of two digits to form a single number is proving a worthy nemesis. The chimps have a famously short attention span and have struggled to apply themselves to the lengthier tasks. Starting when they were aged about four, it took Ayumu and two other young chimps about six months to memorise the digits 1 to 9. In 2009, Matsuzawa and his team added the number 10, then 11. “There might be a limit to how many things they can pay attention to at one time,” the professor says. “One to nine was easy, but one to 19 may be too much for them. In that sense, they’re like us. Numbers have infinite sequencing, which is why we developed the decimal system. As an extra inducement to persevere, each correctly completed task released a tiny chunk of apple or grape, or half a raisin, down a chute and into the windowed enclosure separating Ai and Ayumu from the watching researchers. 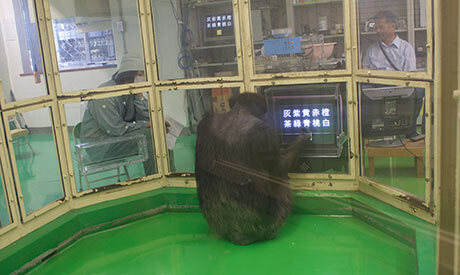 Matsuzawa says our temptation to ascribe “super-chimp” status to the animals stems from a natural aversion to being thrashed at memory tests by primates. “Some humans are uncomfortable with the idea that beasts are cleverer than us, because we are supposed to be their intellectual superiors,” he says. Now 13, Ayumu is being encouraged to produce offspring that, Matsuzawa hopes, will prove more serious rivals than his ageing mother. In chimps, as in humans, the ability to memorise complex scenes or patterns declines with age. In the 2007 experiment, Ai, then aged 31, did not perform as well as the human volunteers. With the first morning session over, Ayumu climbs back out of the lab, while Ai stays behind to play with Matsuzawa, an almost constant companion since they met in 1977, when she was just a year old.